Writers | Brad OH Inc.
Today, the Edmonton Writers’ Group is proud to announce that authors of our current anthology, ‘Edmonton: Unbound’, will be hosting our official book launch and signing event next Sunday, January 7th, from 1:00pm-5:00pm, in the Program Room of the Enterprise Square Branch of the Edmonton Public Library. Come on down for a chance to meet the authors, pick up a copy, and get it signed! ‘Edmonton: Unbound’ contains fourteen stories by twelve local authors, unified only by the common theme of their current hometown, Edmonton, AB. To celebrate this release, we have an interview with one of the ‘Edmonton: Unbound’ authors, Howard Gibbins. 1. You have been with the Edmonton Writers Group for many years. How has the Edmonton Writers Group helped you as a writer? Howard Gibbins: Being a member of the group has helped me to focus on my writing, as well as share ideas with other members such as developing a plot, characterization (i.e., what makes a memorable character). I’ve also found that the experiences of the various members has given me ideas for things to research when writing some of my work. 2. What was your greatest challenge in writing each of the two stories in the anthology? Howard Gibbins: “A Night to Remember” developed out of a writing challenge, and in its first iteration was pretty poor to say the least. I then began working on rather large novel, and found out that I had to either explain way to much in the novel itself, or I could use this story with just a bit of rewriting to explain a lot of the backstory. As for “Tools of the Trade”, I work in the palaeontology department at the University of Alberta, and the tools mentioned in the story are actually in our collection. When I first saw them, I got the idea for the story and it quickly developed into the final product. Not to give too much away, I guess the biggest challenge to this would be the setting of the house as it had to have certain physical characteristics which meant I had to sour Google Maps® to find a suitable location. 3. You include time travel in your stories. What is it about time travel that interests you and makes you want to write about it? Howard Gibbins: Actual time travel is actually only featured in “A Night to Remember” but I guess what interests me is that there are numerous hypothesis dealing with temporal travel, but virtually the only one you ever hear about is a linear progression which is what is dealt with in the “Grandfather paradox” i.e., if you go back in time and kill your grandfather, how do you get born? I’m well aware that time travel isn’t possible with our current understanding of physics, but then again the other stories in this world all revolve around a scientist who has discovered/developed a new physics. In “Tools of the Trade” the main character visits an alternate in a dream-like state, so this is kind of cheating on the time travel idea, but hopefully it works for the reader. 4. Which writers do you admire, and why? Howard Gibbins: I read a lot of books. As far as fiction writers are concerned Robert Heinlein, Isaac Asimov were some of the first ones that I read when I was young. This was followed by James P. Hogan, Robert Sawyer and Chris Bunch. These are all Science Fiction writers but I try and add an element of mystery into my writing as well so authors such as Agatha Christie, Sue Grafton, and other have also influenced me. As for non-fiction, I tend to read authors that have a science background themselves as they are aware that research is required to be able to write science books. 5. What part of writing do you like the most? What part of writing do you like the least? Howard Gibbins: The part I like the best is seeing the story develop, especially when it takes off on a tangent, and I have to try and figure out how to explain what happened (assuming I keep it in – and I usually do). As for what I like the least, I guess that would have to be all the self-promotion that one has to do now-a-days to get your stories out there. Howard Gibbins’ stories, “A Night to Remember” and “Tools of the Trade”, are featured in ‘Edmonton: Unbound’, which you can purchase now on Amazon. Have a Happy New Year, and remember to come on down to the Enterprise Square Branch of the EPL to get your copy, and meet the authors on Jan. 7th, from 1:00pm-5:00pm! 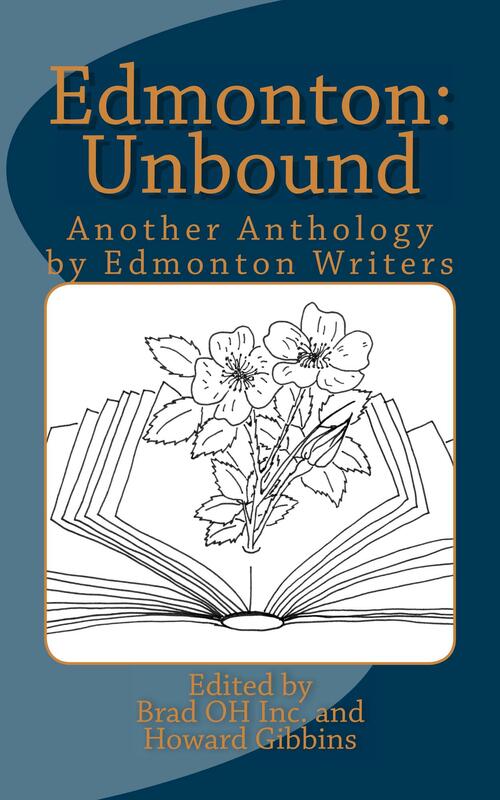 The Edmonton Writers’ Group’s new anthology, ‘Edmonton: Unbound’ contains fourteen stories by twelve local authors, unified only by the common theme of their current hometown, Edmonton, AB. To celebrate this release, we have an interview with one of the ‘Edmonton: Unbound’ authors, Vivian Zenari. 1. There are plenty of weird and wonderful things that happen but the why remains a mystery. Has anything weird/wonderful that has ever happened to you that made you stretch your head and wonder why? Vivian Zenari: My entire life makes me scratch my head, I must admit. 2. Roy was adamant about not leaving the lot. Is there a place that you are very attached to? Why? Vivian Zenari: I am not much attached to any location, I have to admit. I am more of the “grass is greener on the other side of the hill” person. For example, I want to live in Venice, Italy, but apparently it is a terrible place to live. The locals are leaving in droves. Yet I want to live there. Go figure. 3. Your story contains some very supernatural or spiritual elements. Do you believe in spirits? Vivian Zenari: I do not believe in the supernatural at all. I guess for me the supernatural elements in my stories are metaphorical. 4. Roy was not very approachable to certain people but seemed to have a heart of gold, willing to help others down on their luck. Is there someone you can think of like this in real life? Vivian Zenari: One of my heroes is William Lloyd Garrison, an American anti-slavery advocate in the mid-nineteenth century. As well, certain dogs can be selfless. 5. You certainly have a lot of experience with writing. At what point did you realize you wanted to be a writer? Vivian Zenari: Since I was a little girl I have been writing. I have always been afraid of writing, though. I am a fearful person who lacks confidence. Writing is a perfectly unsuitable occupation for such a person, and I have tried to steer my way away from it during different stages of my life. Right now I am steering towards it. At this stage of my life I have nothing to lose. My son is almost grown, the pets seem able to get along without me, and my husband is chugging along without much need for my intervention. Vivian Zenari’s story, “The Lot”, is featured in ‘Edmonton: Unbound’, which you can purchase now on Amazon. Today, the Edmonton Writers’ Group is happy to announce that ‘Edmonton: Unbound’ is now available on Amazon.ca. ‘Edmonton: Unbound’ contains fourteen stories by twelve local authors, unified only by the common theme of their current hometown, Edmonton, AB. Ranging from simple domestic interactions, to futuristic sci-fi adventures, to deep psychological introspections, these stories take a look at Edmonton from viewpoints as different as the writers themselves. This anthology is a love letter to our hometown, and demonstrates our incredibly varied approaches to literature, and to life. To celebrate this release, we have an interview with one of the ‘Edmonton: Unbound’ authors, Hai Doan. Hai Doan: My goal was to write a story that was based in Edmonton and since I love riding on the LRT, it seemed natural that I would include our transit system. Plenty of people take the LRT, all from different walks of life, so I wanted to share a story from a viewpoint of one of those passengers. I enjoy light hearted comedies so it is surprising that the plot ended up being rather dark but the ideas flowed well and I just went with it. 2. What events in your background led you to want to write? Hai Doan: When I was a child, I loved to take books out of the library and read them (and I still do). Two of my favorite authors were Roald Dahl and Gordon Korman. I especially enjoyed the books from the “McDonald Hall” series; I found the stories to be hilarious! This made me want to become an author too because then I could try to make people laugh as well. 3. What difficulties did you encounter while writing this story, other than finding the time to do it? Hai Doan: I think the most difficult thing was probably getting started and putting some writing on the paper (or computer screen to be more accurate). Once I got started, the writing became easier. For this short story, I didn’t plan the plot out as much as I normally do and just wrote down the ideas as they came to me. Hai Doan: I tend to plan out my stories. Actually, I would say I plan so much that I often don’t complete the story! I like to jot down notes about the plot, daydreaming about what could happen next but I have a hard time putting all these ideas into a completed work. I remember starting a fantasy genre story and I had all the main points of the plot figured out; I even had drawn maps of the world I had built. I never finished the story though. I think this could be due to the fact that I find world building and plot creation so much fun and actually writing the story can be “hard work”. I think I should take the advice of some authors and just write since the first draft is never perfect anyways. Hai Doan: My response to “writers’ block” is similar to my approach for working on homework assignments. If I find myself wracking my brain for a long time with no success then I would temporary stop working on the task; I would either take a break or work on something else. I find that allowing my mind to focus on something else for awhile that once I do return to the original task that sometimes I somehow “magically” have an epiphany which makes the solution very clear. Hai Doan’s story, “LRT Ride”, is featured in ‘Edmonton: Unbound’, which you can purchase now on Amazon.ca. Here at Brad OH Inc., we are thrilled to announce the impending release of another anthology by the Edmonton Writers’ Group. Like our previous anthology, ‘Between the Shelves’, ‘Edmonton: Unbound’ features stories from twelve different local writers, this time unified by the theme of their hometown, Edmonton, AB. Through fourteen short stories, these writers take us to places as wildly different as the writers themselves. Further, all profits from ‘Edmonton: Unbound’ will be donated to support the Edmonton Public Library (EPL), who have been gracious enough to house our humble group for over a decade and a half. Once again, the book will be available through Amazon as both a paperback and an e-book, and will be sold by contributing members of the Edmonton Writers’ Group at live signings and events—to be announced soon. So, stay tuned to us here at Brad OH Inc. for all the information you need. The final proofs are currently in our hands, so the full release will be upon us soon. We hope you enjoy reading this book as much as we’ve enjoyed creating it! Today, we’re happy to formally announce that the sales of ‘Between the Shelves: A Tribute to Libraries by Edmonton Writers’ have led to the donation of over $700.00 to the Edmonton Public Library System We at Brad OH Inc. think that’s awesome—and we couldn’t have done it without all of you! Many of the Authors (and both Editors) will also be set up at ‘Words in the Park’ this Saturday, September 26th from 10:00am-4:00pm in the Sherwood Park Community Centre. We’ll be selling and autographing copies of ‘Between the Shelves’! In celebration of these accomplishments, we have an interview with Editor and Author Hal J. Friesen, who appears in ‘Between the Shelves’, which you can now purchase here in either Kindle ($2.99) or Paperback ($12.50) copies. All proceeds are to be donated to the Edmonton Public Library System. Brian Clark: What is the biggest thing you have learned from this self-publishing experience? HF: I learned how achievable it is to put out a product of professional quality using readily-available tools. There were some frustrating moments getting the book formatted properly and tweaking cover blurbs, but on the whole it felt great to see a self-published book that could easily have come from a professional publishing house. I also need to mention how pleasantly surprised I was at the scope and variety of stories submitted to the anthology. I thought I had a pretty good idea what I was going to get from the EWG group members, but they surprised me in a very good way. Vivian Zenari: What is your educational background, and how has that influenced your writing? HF: I got my Bachelor’s Degree in Science from UNBC with a Joint Major in Chemistry and Physics, and a Minor in Mathematics. Basically for my undergraduate degree I was trying to refuse specialization, which in hindsight might not have been a good approach in terms of employability. I had knowledge in many fields but was missing snippets from each to prevent me from being completely proficient. My Master’s Degree in Science, focusing on Plasmas and Photonics, helped me tune my abilities and knowledge toward more practical applications – as ridiculous as that might sound after working on laser fusion experiments. The breadth of theoretical and experimental science experience I’ve gleaned through the years helps me to appreciate how certain science fiction ideas might be implemented, the realities both pleasant and unpleasant of logistics that really help make a fantastical proposition seem real. When I wrote in high school I was thinking of sci-fi notions in a more detached and academic way. After academia, ironically, I think about them more in terms of what’s happening on the ground, what’s happening to the little guy who has to pull the levers, which helps make science fiction more meaningful to readers. Brad OH Inc.: Hal, your story is about a man (Albert Einstein), gaining great knowledge from libraries, but also experiencing stunning existential terror. Do you consider libraries to be places of hidden danger, or is learning in general a threat to our sense of being? HF: I used to read these time machine choose-your-own-adventure books, and they were like puzzles where you got stuck in time loops until you figured out the correct sequence of events to escape a grisly fate. There was one particular instance where I was trying to avoid being guillotined, but kept getting sent back over and over again, being chased, being caught, having the blade fall – to the extent that I fell asleep and had nightmares about it. Libraries taught me to be utterly terrified of the Spanish Inquisition. I think in our age of ubiquitous fear-mongering, it’s important to recognize libraries and their potential role in contributing to the general fright that fits so well in a terror-state. In this story I wanted to show that even a brilliant Einstein can’t escape the spine-tingling horror of a nameless source of danger. His existential cataclysm in a place of learning draws close parallels to the dread during the discovery of a newly-christened terrorist cell, or the announcement of the construction of yet another totally-necessary prison. I felt that the role of books and libraries in general has been undervalued in terms of their capacity to inspire totally irrational fear, and wanted to emphasize how deeply they can touch our being versus other forms of media. Brad OH Inc.: Why did you choose Einstein as your character? Do you have some arcane knowledge of his life the rest of us aren’t privy to? Is there any biographical truth to this tale? HF: I have a copy of Einstein’s original manuscript on Special Relativity, and if you go to the trouble of reading it you find very strange references in the margins, almost as if he was placating some unseen observer. With extensive and advanced calligraphic decoding I was able to parse some of the scribbles he had tried to hide after the fact, after whatever it was had stopped peering over him threateningly. It was clear he had communion with a library spirit, or as he named it, Wilfred, though exactly which library was unclear – I used artistic liberty in that aspect. It’s amazing how much you can discover when you read the source material rather than just taking secondary sources at face value. Brad OH Inc.: Your passion for libraries is clear in this story. Share with us some of your most formative memories of being in the library. Is there any encounter in particular that stands out as a moment where knowledge was so startlingly thrust upon you? When I was a child, there were summer reading challenges where you got to move your pawn along footsteps lining the library walls, taking a step for every book you read. The path took a circuitous route around the two-story Prince George Public Library, and I would take out piles of books in order to get to the end. And I did. My prize? PTSD from an impossible and horrific Spanish Inquisition time machine loop. And a ribbon. The library used to have person-shaped chairs in bright colors, and I would sit near the large windows and browse through Goosebumps books, Tintin comics, and fantasy books. I would sway back and forth in the S-shaped chairs, knocking them flat onto the back, or upright again with a satisfying thunk. The trips to the library were a fairly regular occasion – my mother would tiptoe off to the romance section, and my brothers and I would spin the carousels housing adventure and horror novels. Getting my first library card was actually one of my happiest childhood experiences, because I felt like I had graduated from this semi-weekly family ritual and had become an adult. It was a lot better than any actual graduation, that’s for sure. Brad OH Inc.: Your writing has historically been focused on some pretty heavy scientific concepts. What do you consider to be one of the most interesting unanswered questions in modern science? Do you have any possible ‘dream scenario’ solution to this quandary that strikes you as the most appealing? HF: Not to avoid the question, but I guess the more interesting questions are ones we haven’t thought of yet. The untapped potential and dark corners of our understanding are very exciting places, which is why I enjoy good hard science fiction so much. One recent discovery was that the brain might have a lymphatic system, which opens the door to all sorts of medical progress and better development of humanity. The unanswered question of life beyond Earth is a continually fascinating one for me, and my dream scenario is that I live long enough to see contact happen. That would be a great privilege. The unification of gravity and the other fundamental forces is another issue that fascinates me. I remember the exact place where I first read Maxwell’s derivation of electromagnetism and the intimate relationship between them. I literally got up and wanted to run around (but couldn’t in my cramped dorm-room) because I was so excited by the beauty of something so connected and intertwined. Connectedness, for lack of a better term, is something I explore a lot in my writing, and it interests me equally in the natural world. Similarly, the unification of quantum mechanics and general relativity – the small with the very large – is also quite an interesting unanswered question. I’ve read a proposal that suggests the answer might be in our interpretation of time itself, which sent my head spinning in beautiful pirouettes. I think some of the deeper philosophical-physics questions might go unanswered for a long time, but can make you experience some of the same existential schism Einstein does in the story. Questions like: what exactly is charge? What exactly is mass? We have equations that describe what they do but that’s different from knowing what something is. There’s a joke that if you want to drive a physicist crazy, ask him what charge is. Try it sometime. Brad OH Inc.: As a follow-up to the former question, of the myriad scientific discoveries throughout history, which would you most like to have been a part of, and why? HF: I’ve developed an unlikely fondness for light and optics, so I think I would have loved to have been a part of Maxwell’s discoveries unifying electricity and magnetism. Any of the so-called Maxwell’s equations. Ampere, Gauss – to have been around any of those guys would have been gnarly and radical, and I’m sure my language wouldn’t drive them crazy. Gauss was a genius. I would say quantum mechanics, but the results aren’t as easy to put your hands on or see with the eye. The laser would have been pretty amazing to discover. I got the chance to hear Charles Townes, one of the co-inventors of the laser, speak, and it was surreal to see him use a laser pointer to point at a slide of his original laser conception. He made lasers originally for astronomical purposes, and at the time of his talk (age over 90) he was still doing that. There’s a raw enthusiasm and electricity some scientists exude and I think to have been around any of those remarkable individuals would have been illuminating and inspiring outside of the discoveries themselves. Remember to catch the authors of ‘Between the Shelves’ at ‘Words in the Park’ this Saturday, September 26th from 10:00am-4:00pm in the Sherwood Park Community Centre! Finally, be sure to visit Hal J. Friesen at his blog right here, and check out his story “Reading After Hours” in ‘Between the Shelves’. You can purchase it now on Amazon. The following is an interview with Timothy Fowler, who appears in the Brad OH Inc. and Hal J. Friesen edited Anthology ‘Between the Shelves: A Tribute to Libraries by Edmonton Writers’, which you can now purchase here in either Kindle ($2.99) or Paperback ($12.50) copies. All proceeds are to be donated to the Edmonton Public Library System. When not writing for Scribbles and Snaps, Tim works with a Global Fortune 100, leading a team of incredibly talented people to deliver the nearly impossible to their customers doing important work. He travels nearly full time as a result of this engagement, and part time for leisure. He scribbles pictures and snaps stories for his own pleasure and hopefully yours. He lives in St. Albert with his lovely wife, Saskatchewan-born farm girl, Kathy, and Gordon Setter, Rigby. He is Scribbler, Snapper, Navigator, Outdoorsman, Fellow Traveller. He is from Granite Rockies, and Prairie Dust, from Boreal Forest and Wanderlust. Tweet @TimothyDFowler or read his blog here. In “The Library”, you talk about the hours spent in your Aunt and Uncle’s library. Do you try to model your own home library after theirs, or after another library? TF: My library mirrors my Aunt and Uncle’s with the soft light, big chair, and favourite books on dark wood floor-to-ceiling shelves. Thick carpet under sock feet helps make it very quiet like theirs was. Sometimes guest’s children get rocked to sleep there. And the kids books are on the lowest shelf so they can choose which books they want to read, or have read to them. I have my own childhood books on the lowest shelf. Like their house, from the library you can smell dinner underway. I started my career in culinary as as apprentice then journeyman chef, now manager. Roughly a quarter of my books are related to food, collected over decades of kitchen work. Many meals are first conjured in the library. My uncle had a collection of food related books on the shelf, and I think of him often in his hotel kitchen. My library feels like an extravagance, and I suppose it is. Now I keep a special shelf for writing books, and borrowed books. I now apprentice as writer. You’ve been writing on your Scribbles and Snaps blog for a year and a bit now. How has that project evolved from when you started, and where would you like to see it go? TF: For many years I have been quietly writing, but mostly keeping outputs to myself. “Platform,” Michael Hyatt’s book helped me decide to launch my Blog, and write in a public way. I write to entertain, and encourage readers to think about life experience in a new way. I hope the blog posts do this. My goals for 2015 include submitting 52 pieces for consideration to be published. “The Library” is one that will be published in 2015. Did you start with writing or photography first? How does photography play a role in your writing? TF: Since sharpening my fat red pencil and spelling my name with letters in the right order I have been marking up pages with stories. Recently I bought a LAMY fountain pen, and find writing longhand with a real pen and real ink on real paper, a sensuous pleasure. I am saving my money for a Sailor fountain pen with a gold nib. Now I write by hand in a notebook every day. After my sixteenth birthday I bought a Pentax 1000 35mm SLR. Before turning twenty I travelled the South Pacific, Australia and New Zealand making hundreds of photographs. I read Freeman Patterson’s great book “Photography and the Art of Seeing” and work hard to see. We writers spend a lot of time wrestling words, showing over telling, but before any of that happens we need to “see.” So for me making pictures and writing are very much tangled up. I experience them together. I picture what I write, and I hear stories looking through my viewfinder. Metaphors are literary viewfinder for readers. I explore the question of “Why?” for both writing and photography on my blog. I find them both rewarding, but recently have been focused precisely on writing. Who has inspired you as a writer? TF: Mark Twain’s “A Dog’s Tale” and “A Horse’s Tale” had a profound effect on me, teaching me about voice and story point of view. He tells gut-wrenching stories within stories. The story is not the story at all. And it is. I know Stephen King is cliché-popular but his storytelling ability influences me today. He just jumps off the first word and tells the story. Recently Alberta’s own Fred Stenson’s “Feigned or Imagined” has been great fun and his writing started me on several stories of my own. The truth is we are influenced by whatever we read, and now more than ever, I read constantly. Precise language and particular personalized description is such a pleasure to read, and a tremendous challenge to write. What do your children think of your writing aspirations? Are any of them following in your footsteps? TF: Both my boys are great storytellers, but neither has put pen to paper in a serious way. Both have a keen interest in photography. And both, if I may say, competently maneuver in the kitchen. My whole family encourages me to write—at least to my face. Timothy Fowler’s story “The Library” is featured in ‘Between the Shelves’, which you can purchase now on Amazon. The following is an interview with Author Vivian Zenari, who appears in the Brad OH Inc. and Hal J. Friesen edited Anthology ‘Between the Shelves: A Tribute to Libraries by Edmonton Writers’, which you can now purchase here in either Kindle ($2.99) or Paperback ($12.50) copies. All proceeds are to be donated to the Edmonton Public Library System. Vivian Zenari lives, works and writes in Edmonton. What is your educational background, and how has that influenced your writing? VZ: I have a PhD in English literature with a specialization in 19th century American literature. I am sure my training has influenced my writing, though I am not sure how. Many of the writers I admire are from the nineteenth and early twentieth centuries; perhaps it’s more like I have tried to work in fields that reflect my interest in reading and writing. Who has inspired you as a writer? Why are avant-garde authors so important to you? VZ: These days I like Henry James (always), Flannery O’Connor, Rawi Hage, George Eliot, and the usual modernist suspects (Virginia Woolf, Ernest Hemingway, Edith Wharton). I just finished reading Sean Michaels’s Us Conductors and loved/admired that. I like the absurdists like Franz Kafka and Nikolai Gogol and postmodernists like Don DeLillo and Paul Auster. I admire writers who take chances, I suppose. I like the idea of transcending tradition in form as well as content. As well, as a reader and writer I am a bit jaded, perhaps, so it takes a lot to stimulate me. Did you have a personal interest in Dewey before you began this short story? Why did you decide to feature him in your story? VZ: I have training as a librarian as well, and so I have been familiar with him as a figure in library studies history. I have always found him to be a hilariously awful person. Once I read more about him, my appreciation/contempt for him grew. He also typifies the mentality of the late 19th-century American (an area of history I know something about). His ambitions and upbringing put him in the right place at the right time. That aspect of American society interests me too–he is a self-made man, but he demonstrates the dark side of the self-made man syndrome: monomaniacal, overly rational, greedy. What, in your opinion, are the key distinctions between literary fiction and genre fiction? In which category would you classify yourself? VZ: I tend to think of genre fiction as formula-dependent and literary fiction as aspiring to be outside formula. I suppose I aspire to be outside formula, though I realize all writers model themselves on something, and formulas are a kind of model. Literary versus genre seems to be a useful distinction for publishers, but the term is likewise important to writers and readers, who have to work with what publishers want to give them, for better or worse (okay, for worse). It’s true, though, that some people only read detective fiction and romance fiction, some people never read anything by women writers or written before 2000. I don’t think this is good, but considering all the people writing, reading, and publishing (past and present), I see why categorization is practical. What is your next writing project? Can you tell us a little about it? VZ: I’m sending a short-story manuscript around to publishers, and I’m slowly working on a novel. I’m starting to rev myself up for writing nonfiction too: we’ll see how that goes. Finally, don’t forget to come by and visit the authors of ‘Between the Shelves‘ from 7-9pm on May 6th, in the Centennial room of the Stanly Milner Library in Edmonton!